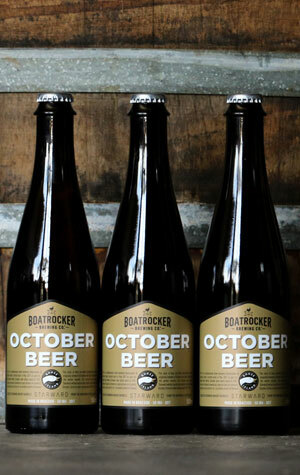 Back in May, while in Melbourne for Good Beer Week, the man in charge of overseeing Goose Island's massive barrel program visited Boatrocker Brewers & Distillers's Barrel Room to create a beer. There, Bill Savage and Boatrocker's Matt Houghton settled upon a rarity, an October beer – something of a pre-cursor to barley wines. After all, the thinking went, when you've each got an iconic barrel aged imperial stout in your lineup (Ramjet and Bourbon County Stout), why not do something different? They opted for a SMASH beer too (Single Malt And Single Hop, both sourced from the UK), then put the beer down for winter in Starward Whisky barrels. One imagines there was a fair bit of liquid left in the barrels too, as Starward's young and juicy whisky is prominent, riding a sea of rich, sweet caramel malts, vanilla and dried fruits. There's a touch of balancing bitterness but nothing to get in the way of the after dinner qualities of the beer; best enjoyed with some strong cheese and company, you'd think. You can read our Day In The Life two-parter on the respective barrel programs too – Boatrocker and Goose Island.